This week The Cleansed returns to Radio Drama Revival, bringing us back to the end of the world, which begins in a time not-so-distant from now. The scathing, unremitting prologue episode “The Breaking” introduces the characters John Prophet, David Brenner, Sam Miller, and Luke Bovonsky, who are pulled into a topsy-turvey world when things go awry at a little retelling of “War of the Worlds” taking place at the Armory in Bangor, Maine. 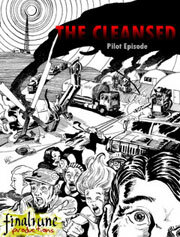 Radio DJ “Comeau” is just trying to run the board at the radio station – the last source of news in a world already suffering from blackouts, ongoing war and fuel shortages – and he is going to bear witness as the strangest thing in recorded history comes to pass in this small town in Maine… An event which will shape the future of the fallen world forever, and pave the way for Season 1 and Season 2 of The Cleansed.